From hands-free wheelchairs, to a foot-pedal-propelled kayak, interactive drones, and innovative systems that make recreation more fun, 283 UCF engineering and computer science students will showcase their inventions and new technologies Thursday during the Fall 2015 Senior Design Showcase. Some prototypes offer potential solutions to real-world problems. Others offer a bit more fun and have the potential for commercial development. It’s just what leaders in the College of Engineering & Computer Science want to see from their graduating seniors. The goal of the showcase is to give students a chance to display their final projects, demonstrate their technical knowledge and show they are fully prepared for engineering and computer science jobs. On a more practical level, the projects represent a significant portion of students’ grades and in many cases is the final step before graduation. For a list of all 63 projects and summaries, click here. The Fall 2015 Senior Design Showcase will be in UCF’s Engineering II atrium Thursday, Dec. 3, from 8 a.m. to 2 p.m. The event is free and open to the public. 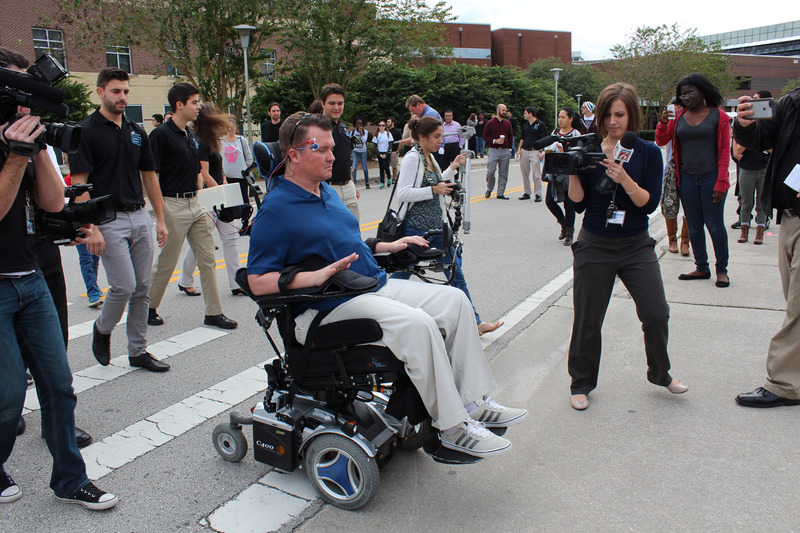 The Dec. 3 showcase will include student-made inventions to help wheelchair users with severe mobility impairments operate their power chairs by just moving facial muscles or looking a certain direction. For example, a team of five mechanical engineering students created a first-of-its-kind, low-cost system using 3D printing and electromyography (EMG, or muscle sensors). The students put together several electronic components into a small 3D-printed box that attaches to the joystick on a wheelchair. EMG sensors are then placed on the person’s face, near their forehead. The sensors send a signal to the box and depending on which muscles are used, the signal moves the joystick propelling the person forward, backwards, right or left. The wheelchair – a project led by UCF-based nonprofit Limbitless Solutions, known for making 3D-printed bionic limbs for children – was debuted for media on Nov. 24 and received extensive news coverage, including more than 500,000 social media views and shares to date. See Fox35 Orlando’s video about the wheelchair here. Another wheelchair project, the “Smart Chair: Sensor & Mind Automated Remote Technology Power Chair,” controls a power wheelchair with eye movements, depending on the direction the user looks when looking at sets of LED lights positioned in front of their head. The technology was created by a team of four electrical and computer engineering majors. Two teams have made kayaking a lot easier. A team of four mechanical engineering majors came up with a foot-pedal-powered system that can be retrofitted onto any kayak without altering the body of the vessel. The kayak is propelled hands-free, allowing users to ditch the paddle and instead free their hands to cast a fishing line or take photographs. Another team of four mechanical engineering majors will showcase their easy-to-use kayak anchor, which employs a pulley system from the bottom of the vessel. That team, called “JAMM Pole,” is seeking a patent. A team of four electrical and computer engineering students have created a kit that can help improve users’ boxing techniques. The “HitSmart” system can be fitted onto existing boxing gloves and provides feedback data to the user. And for people who want to improve their BMX racing skills, a team of four electrical and computer engineering students has created a simulation tool that monitors acceleration, heart rate and reaction time. The data is transferred in real time to a mobile application. What’s more, the device is solar powered and captures the energy from the BMX rider pedaling.